Carly Robertson of Paper in Bloom is so lucky to have a handy husband, he has built her a new table for her studio, and it is PERFECT for her scrapbooking. The table is approximately 6' x 4' which is the perfect size to scrapbook on, she can layout all her supplies and pictures, and still have room to create! and below the table top she keeps some of her cardstock, pattern paper and scrapbooking kits. Because Carly sews on many of her layouts she has also created this lovely little sewing centre in her studio. 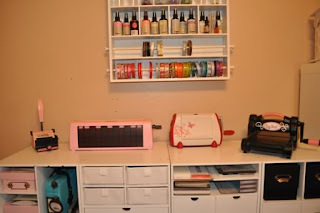 I love Megan's pace, its so eclectic and fun, lots of display items and even a tape player! I also love that she labels her description inside the picture so if you know what you are looking at. Visit her blog post on her space here she is very honest about her organization, and there's lot's more pictures to look over. 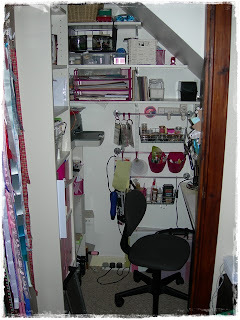 Jane's litle cupboard studio is it is only a 3ft by 5ft space. But you know what? I love it. Everything needed to create is there. 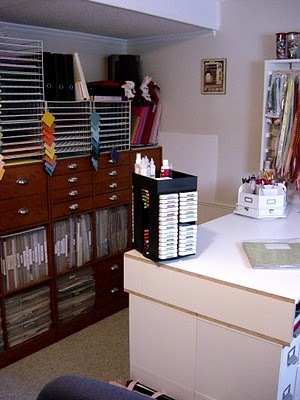 I think this space is one of those that makes you realize that having a small creative space does not mean that you are going to create less or worst than if you do have a larger one. Having a big one has its advantages, but trust me, a little one has them too. 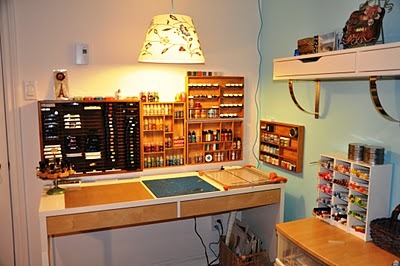 Click here for more photos and explanation on what and why Jane has used for her creative space. Lisa has a fabulous workstation in the middle of her workspace, which was built by her husband, so it holds a really special place in her heart PLUS it has LOADS of storage. 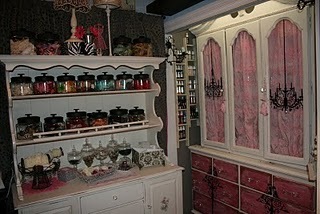 Not only drawers of all sizes but shelves too! 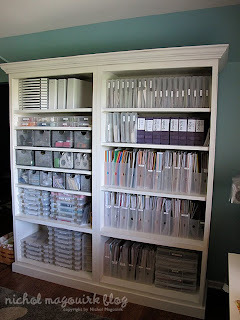 The dark unit had large openings that hold all of Lisa's patterned papers plus the holders - all her precious papers are protected. There's also enough space that she can fit in 13x13 storage boxes of embellishments, its also not so tall that she can add a wire rack storage for her cardstock collection. 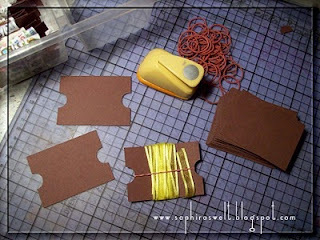 I love her cardstock samplers! Anyone familiar with Becky Oehlers' crafting style knows it is clean, fresh, and visually stunning. So when Becky revealed her new studio, it was no surprise to see the bright white furniture, clean open space, and beautiful touches. The view from the door glows with all the natural light reflecting off the crisp white ceiling. The room measures 12'x12'. There's a sweet little dormer on each side, complete with table and chair. 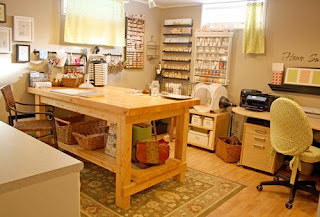 This one serves as Becky's sewing station. Each dormer adds about 3'x3' to the room. 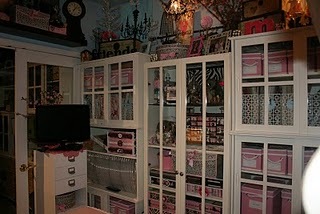 At the far end, built-in storage houses buttons, ribbon, magazine holders, and boxes for storage. The embellishments are organized in rainbow order - a girl after my own heart! 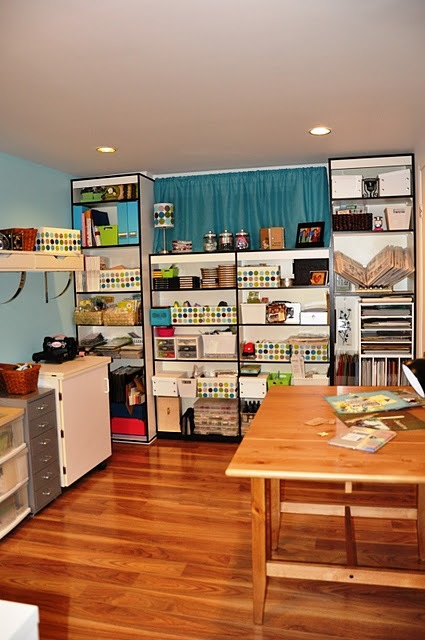 Take a tour of Becky's room and see more photos at Hemidemisemiquaver Design Blog. 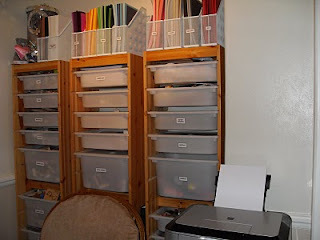 Be sure to tell her Crafty Storage sent you! 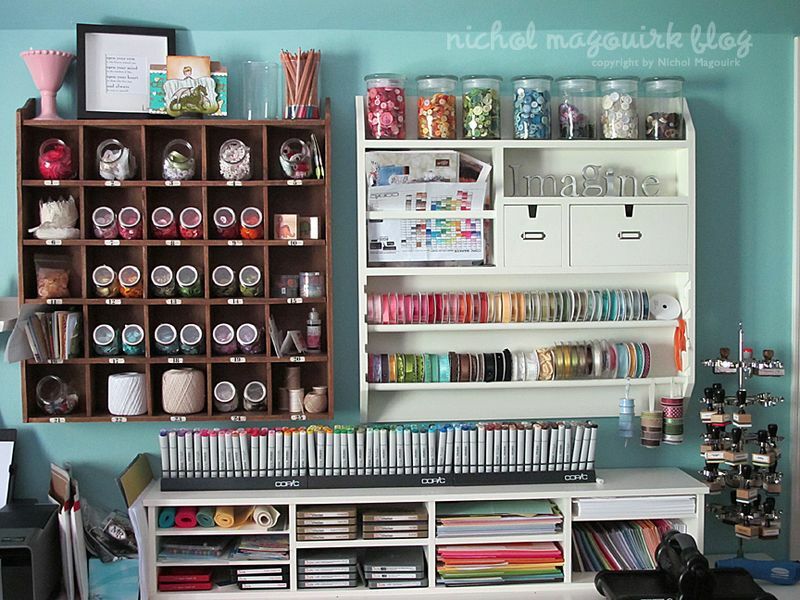 This is Nicol's favorite wall in her studio. 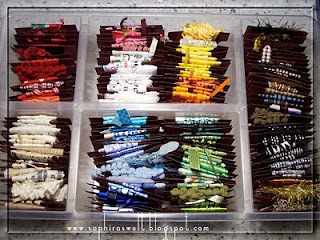 "Loads of color + inspiration (and many of my favorite things: buttons, Copics, ribbon, etc." I think if it were in my room, I'd never leave! 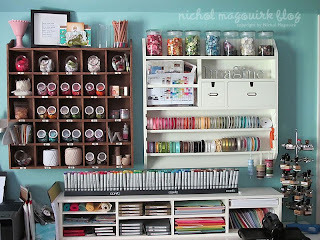 Take a look at this unit, Nicol label's everything. Makes finding what she need's a breeze. 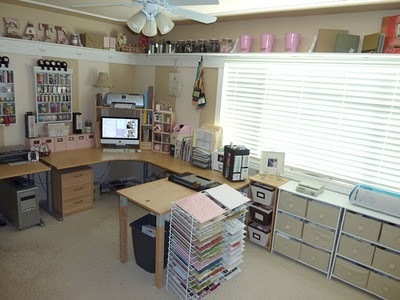 Cassandra has a fabulous workspace, she has revamped it again and invited us all in for a tour, its well worth the trip! 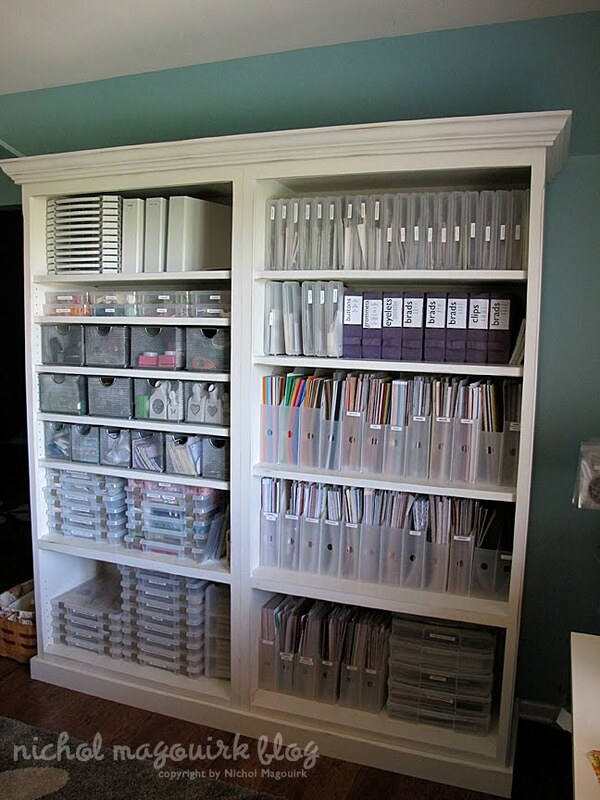 There's lots of storage ideas, all very organised. 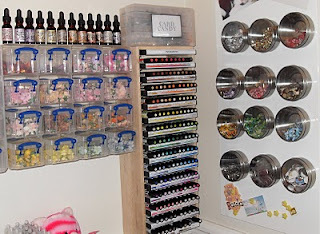 I love this Copic & Glitter storage. 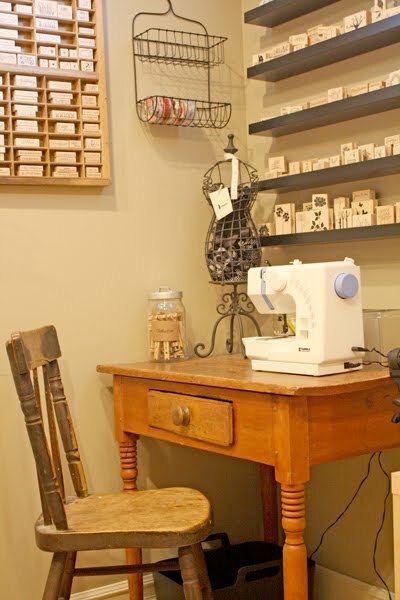 Cassandra loves her embossing centre/Zutter space: she says: "I love having a designated space to work on embossing projects. 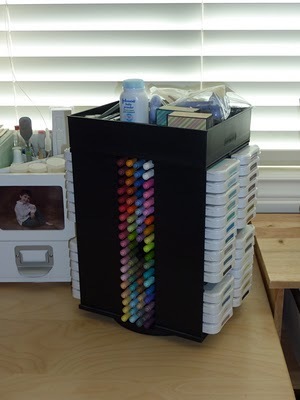 Since I wanted to be able to emboss without having to kneel over, I decided to stack my Jetmax Cubes 3 high so they were closer to a counter height which would allow me to stand while embossing. The cubes also allowed ample space to store all of my dies, embossing folders, and Zutter related products. 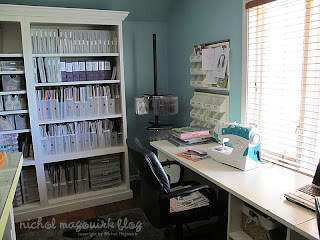 Having a designated space for embossing allows me to keep out what I'm working on at my desk and not have to push everything out of the way to emboss." The room dimensions are just under 10' x just over 13'. France's studio has gone through a redesign. Have a look. 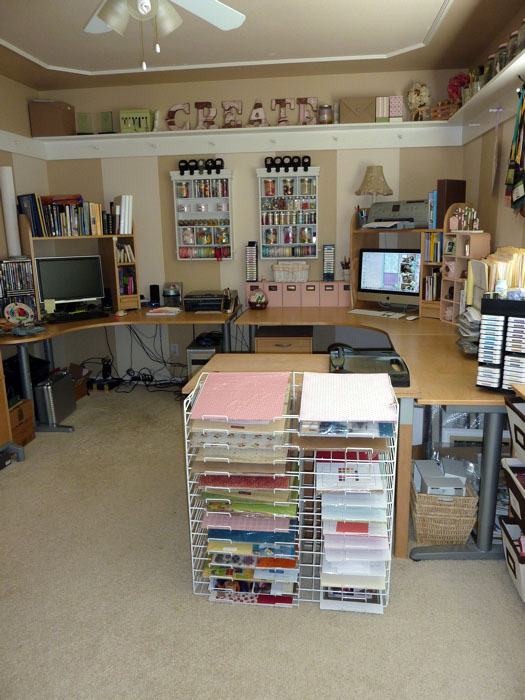 Melinda's - from Scrappy Chicks - craft room is 8 ft x 9 ft. 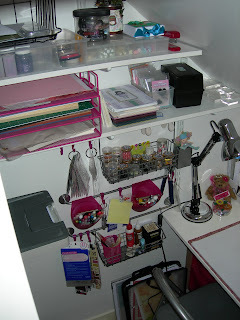 But everything is very organized and very pretty too. 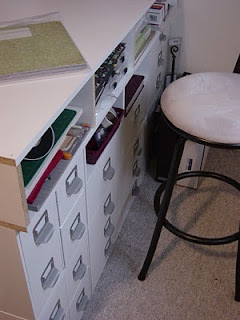 To know more details about her storage systems click here. Paula's craft room is 12ft x 12ft approx. 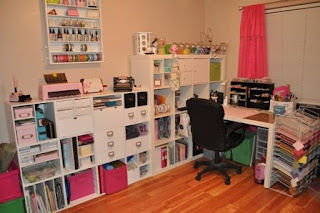 Click here for more photos and ideas! 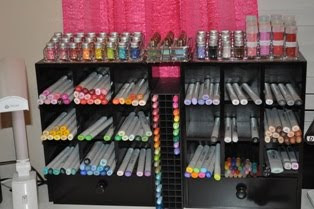 And click here to know more about her Promarker storage. The paper cards are in european size DIN A6. For fitting to the IKEA Box you will need a 2 Inch x 2 ¾ Inch Card. For more ideas visit Saphira's blog here. It is an 11x11 cottage in the back yard. 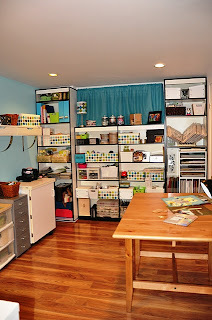 My husband had it built for me so I could have a place all my own. I just think he was tired of all the girly stuff inside the house. 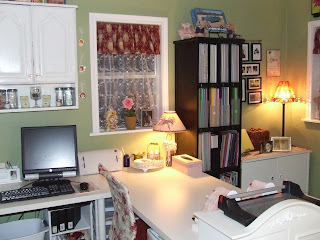 I love shabby chic, it is such a restful look. 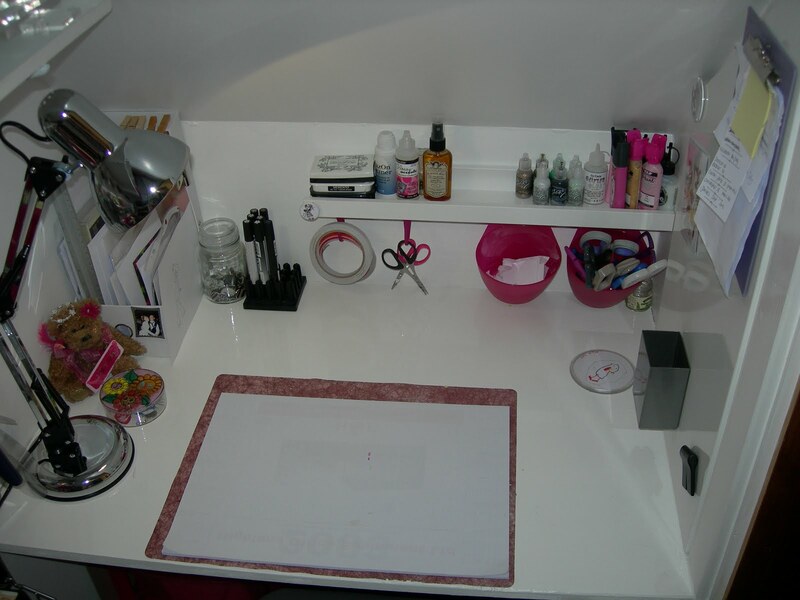 This is a place that I can create, dream and pray in. The antique doll buggies were in my closet for sometime, I just could not get rid of them. 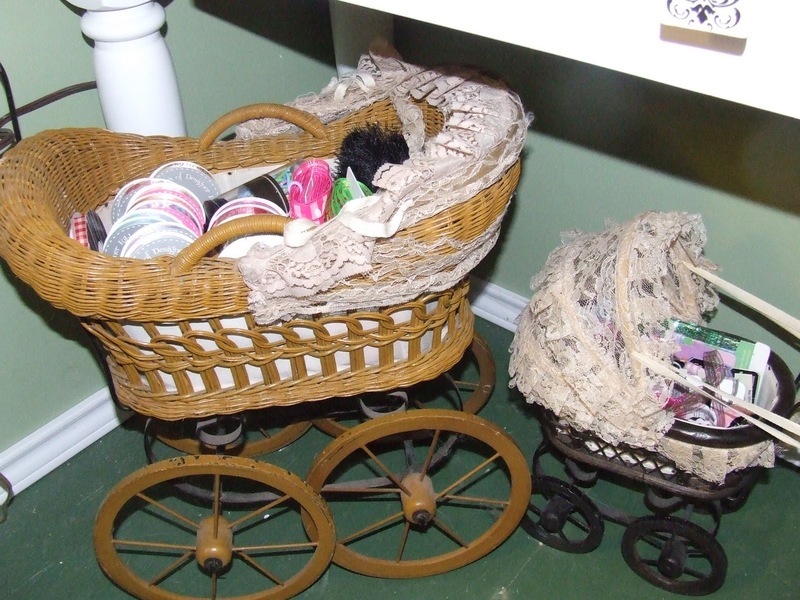 So if I was going to keep them they had to be use, so that is how they became my ribbon storage. 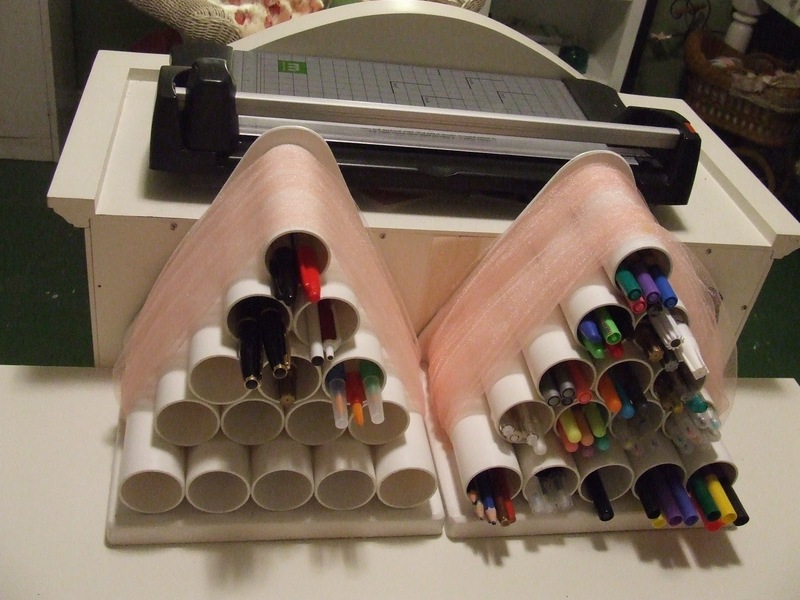 I was talking to my dad about needing a girly pen holder, so he made these, and I think they go perfect in the space. Lisa's very organized craft studio is full of storage ideas. 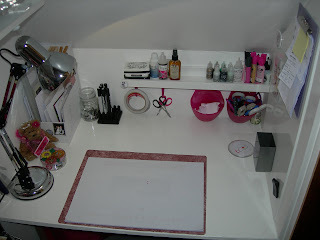 Check her blog here and the post about her studio here.